A very warm and heartfelt Happy Nurses Week to all professional RNs! For many years, local officers at Kaiser South Bay met with members in general membership meetings to discuss how the nurses at the medical center would be thanked during Nurses Week. This recognition usually came in the form of some kind of gift bag or certificate. This year, they decided to do something different. With overwhelming approval from the general membership, members embarked on a journey to find a community cause that they could participate in together to make a real difference. Together with the Los Angeles County Federation of Labor they found SHIELDS for Families, a program in their own backyard. The Compton-based SHIELDS program is dedicated to helping women and children get back on their feet. Before the event, countless hours went into planning, gathering supplies to package over 100 homeless kits filled with essentials, and obtaining all the equipment required to do health screenings. On May 5, around 40 South Bay members, officers, and stewards piled into vans and went on a short road trip to the SHIELDS shelter. They were able to present the shelter with a check for $3,000 and provided over 100 health screenings to high risk families. So instead of giving South Bay nurses a tangible gift this Nurses Week, South Bay members and officers gave a gift in labor, professionalism, in caring and in money to people in need. This was a gift from the heart and in the spirit of altruism. This is about what we, as a union of health care professionals, can do to make a difference. 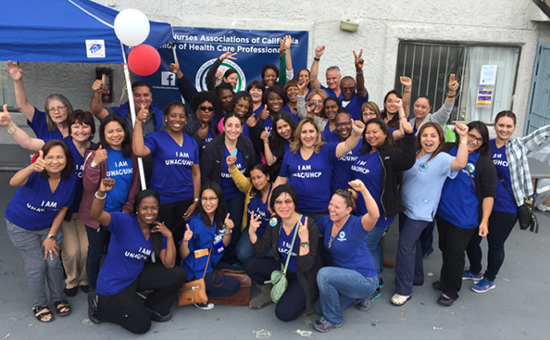 The joy and comfort we witnessed in clients’ faces made us all feel proud to be health care professionals; proud to be RNs, PAs, and NPs; proud to be UNAC/UHCP!